In this study, the authors used UM PDXs to evaluate the efficacy of the selumetinib, a targeted therapy medication aimed at blocking a specific part of one of the pathways responsible for the appearance of UM cancer cells, alone or in combination with other therapies. Currently, there are no viable therapeutic options for the majority of metastatic uveal melanoma patients. Uveal melanoma is characterized by mutations in GNAQ or GNA11 - alterations in proteins normally present in cells that lead to tumour growth. Therapies that target proteins associated with GNAQ and GNA11 (their “downstream effectors”), aiming to inactivate tumour proliferation, are being evaluated. One of these targeted therapies (treatments that block a specific molecule in a pathway) is selumetinib, responsible for blocking a molecule that increases in quantity after disease-causing changes in GNAQ and GNA11 occur. Due to the potential side-effects of this types of treatment, preclinical studies – where drugs are tested in animals and cell culture – are crucial for establishing the safety of new therapies. Patient-Derived Xenografts are models where human cancer cells are transferred to animals whose genetic profiles (types of mutations) are known. They allow for continuous monitoring of the growth of cancer and to test specific therapies in a known full organism. In this study, two chemotherapy agents (dacarbazine and docetaxel), and three different targeted therapy agents (selumetinib, AZ6197 and AZD2014) were used in PDX models. Differently from targeted therapy, chemotherapy works by being toxic to cancer cells, stopping their division. Additional studies were performed with both selumetinib and dacarbazine directly on UM cells in a laboratory dish. The authors found consistent results with those from the SUMIT trial, confirming the low efficacity of a combination of selumetinib with dacarbazine. New therapeutic approaches are, therefore, required to achieve significant improvements in outcome in patients with metastatic disease. Some synergy between selumetinib and darcabazine´s combination had been observed in UM cell lines in the laboratory dish. Unfortunately, when using the same combination in a whole organism, the PDX model, the efficacy of combination therapy vs single agent therapy was not improved. In summary, the preclinical study showed that selumetinib only had weak efficacy in vivo (in an animal model) when used alone, with an overall response rate of 18% and no tumor shrinkage or complete remission. In vivo efficacy of several selumetinib-based combinations is required to improve the clinical benefit of its effects in the cell. 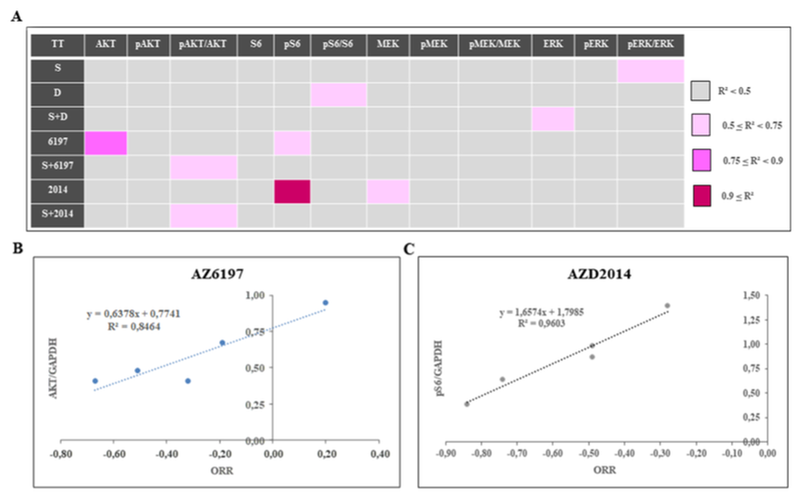 As stated before, in the in vitro (laboratory dish) preclinical assays, the authors have observed a trend towards a synergistic activity between selumetinib and darcabazine in uveal melanoma cell lines; in contrast, these results did not translate to the in vivo experiments using UM. This comes to show that drug efficacity may vary upon the used model to test it and ultimately can differ from its final clinical use. To this end, new selumetinib-based combinations were tested in UM PDXs: selumetinib + docetaxel, selumetinib + AZ6197, and selumetinib + AZD2014. The investigators used a group of PDX mice under monotherapy (with only one of the drugs that were also used in combination regimens) to assess if using the drugs in combination therapy is useful or not. Encouraging results were observed with docetaxel, AZ6197 and AZD2014 in monotherapy. Additionally, combination treatments resulted in an even slight increase in the overall response rate with selumetinib + docetaxel and specially using selumetinib + AZ6197 or selumetinib + AZD2014. In conclusion, approaches that block multiples points of the UM disease pathway in cells, related to changes in GNAQ or GNA11, are promising for the treatment of metastatic UM.